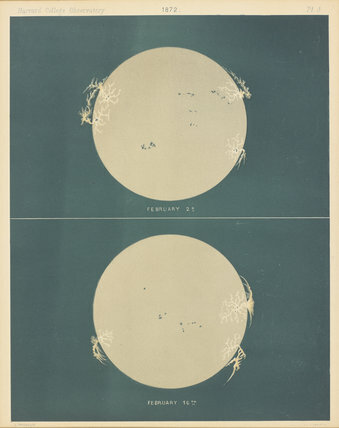 Lithographic colour print issued by Harvard College Observatory in 1876, showing the solar photosphere, the visible surface of the Sun. Based on sketches made Etienne Leopold Trouvelot (1827-1895), a French artist, they show the Sun's appearance in white light on two dates during 1872. Most noticeable are dark markings called sunspots, which are areas of cooler gas on the Sun's surface. In marked contrast are white features called faculae, areas of solar surface that are hotter than their surroundings. With a dazzlingly bright surface and a temperature of over six thousand degrees centigrade these dark and light features are due to contrast effects. The number of sunspots slowly increases to a maximum and then falls back in a clear 11- year cycle first recognised by the German astronomer Heinrich Schwabe in 1843.